Lindiwe Majele Sibanda is Vice President for Country Support, Policy, and Delivery of the Alliance for a Green Revolution in Africa (AGRA). Globally, Lindiwe is a recognized leader and has served as trustee and adviser to numerous international food security-related initiatives. 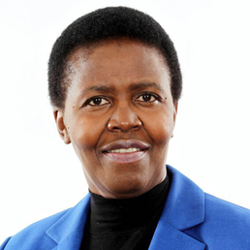 Prior to joining AGRA, Lindiwe was the CEO and Head of Mission of the Food, Agriculture and Natural Resources Policy Analysis Network (FANRPAN), responsible for coordinating policy research and advocacy programs across 17 countries aimed at making Africa a food and nutrition secure region. She is a serving member of, the SDG Target by 2030 Champions 12.3, a commissioner for the EAT-Lancet Commission on Sustainable Healthy Food Systems, the United Nations (UN) Committee for Policy Development (CDP); and the African Union Commission (AUC) Leadership Council. She has served as a university professor in agriculture, animal sciences and veterinary sciences and she is a regular guest lecturer at several universities. She is a recipient of numerous awards for her contribution towards agriculture and food security in Africa; including the, Science Diplomacy Award by the Government of South Africa (2015); FARA Award for Exemplary leadership (2014); and Yara 2013 Prize Laureate; (2013). She is a trained animal scientist, an authoritative leader in agriculture, climate change and nutrition. She holds a BSc Degree (University of Alexandria, Egypt), MSc and PhD from the University of Reading, UK. Lindiwe was recently appointed member of the ACIAR Policy Advisory Council.